Eight brand new, never before released contemporary romantic suspense novellas from today’s bestselling Christian authors in one anthology collection! THE LONG VIEW by Connie Almony: J.T. MacGregor is ex-FBI and training with terrorists. When his former boss makes an unusual request, J.T. wonders about his motives and how he can use them to his advantage. Destiny Long is no stranger to her father’s covert world of catching terrorists, but who is he after now? When J.T., the man behind the one kiss she will never forget joins a fitness club owned by a suspected member of ISIS and he’s found praying head-first into a tasseled rug, she wonders what side of the war on terror is J.T. MacGregor really on. TAKEN by Sally Bradley: Cam Winters has never talked about his past, about life before he became a Christian. Jordan Foster knows that Cam’s a strong, caring man–a man she can see herself with. But he refuses to ask her out for fear of what her brother, one of his closest friends, might say. So Jordan takes things into her own hands. When Cam admits to sharing her feelings, the two fall quickly in love–just as that past that Cam won’t ever talk about returns for Cam and those he loves. A group which now includes Jordan. ON THE ROPES by Hallee Bridgeman: Doctor Ruth Burnette is placed in witness protection after witnessing a Russian mafia execution. Just a week before the trial, Victor Kovalev finds her. Memories of planning her wedding with Victor are wiped clean by the vision of his father executing three men. Does he want to help her survive to her testimony, or is he trying to stop it all together? OUT OF CIRCULATION by Heather Day Gilbert: When Russian mobsters threaten small-town librarian Katie McClure, she is forced to accept an offer of protection from Manhattan bodyguard Ace Calhoun. As they race the clock to find a long-hidden bank stash, Katie discovers too late that Ace might be the wrong man to trust with her life…and her heart. DANGEROUS ALTERNATIVE by Kelli Hughett: Summer in Southern California doesn’t get any hotter than this. When Levi Boulter agrees to work for the FBI behind the scenes in Hollywood, he never plans on becoming an operative working to thwart a plan to assassinate the President’s wife—or on keeping a deadly secret from Mahari, the love of his life. When Mahari is kidnapped, Levi makes the gamble of his life in order to save her. Will Levi’s secret divide them forever, or will they come together in time to stop an assassination? IDENTITY THEFT by Alana Terry: After losing her fiancé in a devastating accident, Lacy meets Kurtis, an Alaska state trooper, and his delightful four-year-old daughter who would love nothing more than to make Lacy her new mom. Things could be perfect, except Lacy can’t shake the nagging suspicion that her fiancé isn’t dead like the police reports claim. All she wants is closure, but as she seeks out real answers, she discovers how deadly the truth can actually be. OBSESSION by Rachel Trautmiller: A surge in crime has left two homeless women dead and Detective Amanda Nettles’ Alzheimer’s-riddled mother as the prime suspect. As his wife embarks on a dangerous game of hide-and-seek with a remorseless serial killer, FBI Agent Baker Jackson Robinson knows he can’t sit idly while the city of Charlotte destroys Amanda’s career a second time. Is her near decade-long obsession with protecting her hometown bigger than the needs of her family? Or are they one and the same? SCENT OF DANGER by Alexa Verde: To find her missing sister, small-town cop Maya Hutchinson risks her life by posing as her glamorous twin. Under escalating attacks, Maya accepts protection from dashing senator’s son Connor McNamara. Cop turned PI, Connor McNamara has his own secret mission and is forced to choose between family loyalty and love. When the scent of danger draws near, will Connor and Maya survive long enough to forgive and accept each other? With a shared theme of hidden identity, these eight stories boast engaging characters and intriguing story lines. I was pleased to discover several authors I hadn’t read before and delighted to read more from those I had previously enjoyed. There were some stories I enjoyed more than others in the anthology, and Scent of Danger and Dangerous Alternative were my favorites. 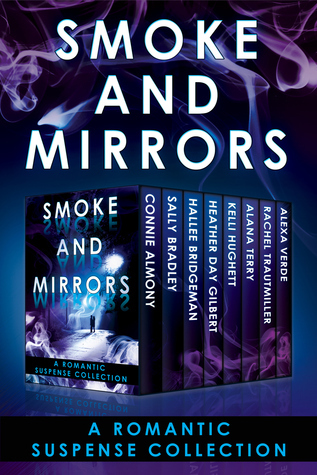 Smoke and Mirrors is a great collection and a recommended read for fans of romantic suspense! 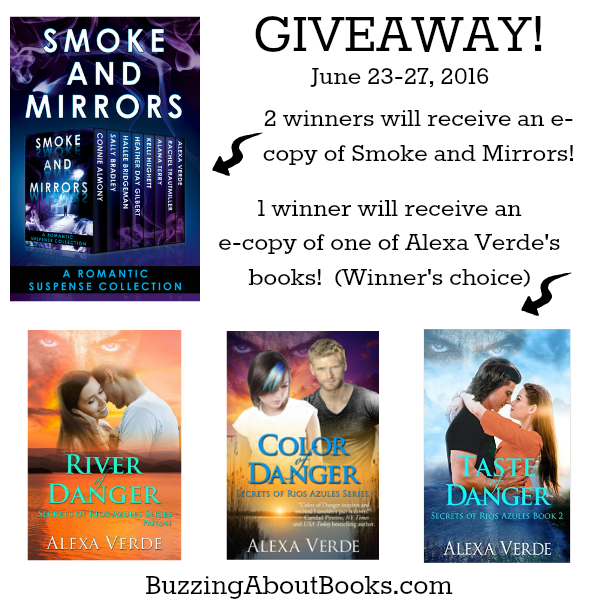 Alexa Verde has graciously offered to give away 2 e-copies of Smoke and Mirrors and an e-copy of one of her books, winner’s choice! Leave a comment below, and be sure to include your email address. The giveaway ends Monday, June 27 at midnight CDT. 3 winners will be chosen and announced on Tuesday, June 28. Follow this blog and/or share the giveaway. Be sure to let me know what you’ve done to earn additional entries! This promotion is in no way sponsored, endorsed, administered by, or associated with, Facebook. ◦Odds of winning are based on number of entries. Alexa Verde fell in love with writing at age eight when she penned her first poem. After publishing 200 short stories, poems, and articles in the five languages she speaks, Alexa has turned her creative passion to writing novels. Her May 2014 debut inspirational romantic suspense, COLOR OF DANGER, is the first in her Secrets of Rios Azules series—set in a fictional small Texas town where rivers and emotions run deep and the richest family in town has a fine taste for food, jewelry, and murder. Yes, it’s a great collection of stories! Good luck in the giveaway, Kim! Great review, Britney! Thank you for this giveaway opportunity. I am definitely a follower! Thanks so much for being a faithful follower, Melanie! Best of luck in the giveaway! Britney, thank you for the great review! This is an awesome giveaway. I’m a follower. Thanks so much for sharing the giveaway and following my blog, Caryl! Best of luck to you! Britney, thank you so much for a great review and featuring Smoke and Mirrors! You’re welcome, Alexa! It’s always a pleasure to read and share your books! I would love to read this. I love suspense. Good luck in the giveaway, Una! It’s always fun to discover new authors! Best of luck to you! Great review. Sounds like a great collection of short stories. Would really enjoy reading. Shared on Facebook. Thank you! It was a blessing to be part of this collection. Thanks for stopping by and sharing the giveaway! Good luck to you! I would love to read this, some of my favorite authors are in it. Best of luck to you, Judy!